The iPad, iPhone, and iPod Touch already have a notepad for jotting down things to remember, but it’s quite simple and bare. Apple devices are all very powerful tools which are capable of doing some amazing things. Realizing this, the people at Evernote have set out to utilize all the capabilities of Apple’s devices to create a very powerful note taking app. 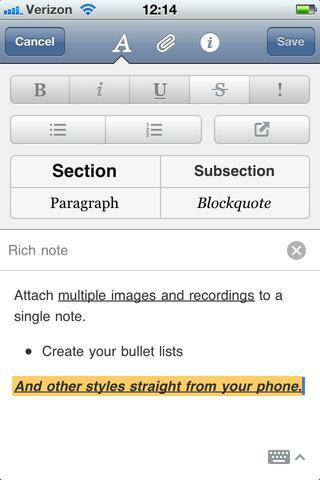 Evernote is a multifunctional text, photo, and audio note taking software. By utilizing Google Maps, Evernote also allows you to keep track of where you made a note, or drop a pin on the map for a new note. Evernote has a well organized system of categorizing your notes, allowing you to add tags and organize notes into easy to access notebooks. In addition downloading Evernote on your computer allows you to capture excerpts and snippets of web pages and save them to your notes. Your entire database of notes are saved to their servers and synched to any device Evernote is installed on. Evernote’s integration of OCR technology is a major feature which really takes it to the next level of utility. With Evernote you can save a picture as a memo to yourself, and the OCR identifies the text in you photo making it searchable in your notes. See a nice bottle of merlot that you like? Take a photo of it with Evernote and you can later search the name or “merlot” to find the image. You can even make a note of the location to remind yourself where it’s available for purchase. 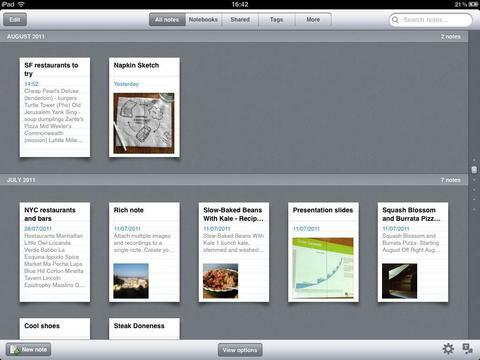 What is really striking is the versatility and range of practicality Evernote has to offer. On both a professional and leisurely level Evernote offers an extremely potent organizational tool at your disposal. Never again will you forget that idea you had, where that restaurant you passed by and wanted to try later was, or how the details of that great joke or quote went. In a sense Evernote offers to make forgetfulness a thing of the past. Buying Evernote adds a number of useful features. For starters the monthly allotment of data you can upload is increased. In addition you can also add and synchronize file folders (PDF, Word, etc.) to your features. These features do not come cheap however, costing $4.99 per month or $44.99 per year. A bit expensive but worth it for anyone committed to making full use of the program’s capabilities. From the artist looking to recall inspiration found throughout the course of his day to an entrepreneur logging ideas for her next business venture Evernote offers a versatile way to catalogue anything you consider significant. AppSafari review of Evernote for iOS was written by Neema Akhtar on September 13th, 2011 and categorized under App Store, Featured, iPad apps, Notes, Productivity, Reference, Universal, Utilities. Page viewed 7338 times, 2 so far today. Need help on using these apps? Please read the Help Page. I recently started using Evernote and its “free” storage space is severely limited. I have over 4000 pics on my iphone and have used only half the iphone capacity. I uploaded 166 pics from the iphone to Evernote, used 99% of Evernote upload capacity and recieved a warning notice that Evernote utilization would be restricted until the next cycle. From a practical standpoint Evernotes data restriction allows only 2% utilization of my iphones capacity per month. With this strict data limitation, it is more functional to use my iphone, ipad, and laptops and “Forget Evernote”.